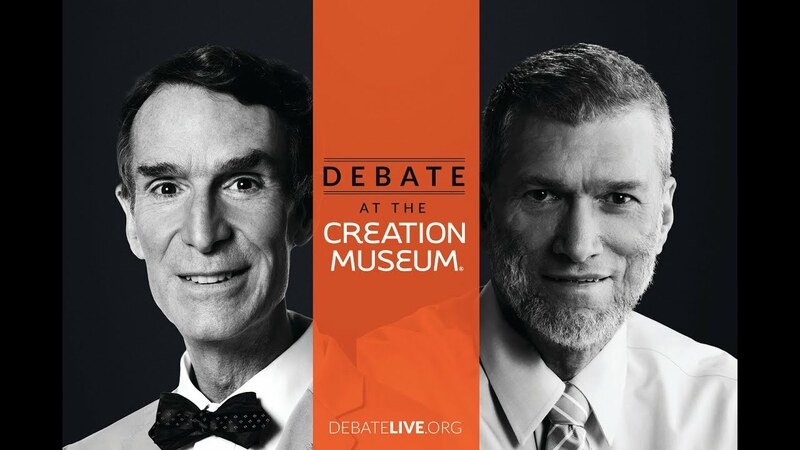 On February 4 “the science guy” Bill Nye, representing the evolutionist perspective, and Ken Ham, representing the creationist perspective, debated the question, “Is creation a viable model of origins in today’s modern scientific era?” The debate was live-streamed on the Internet and watched by a large audience. I didn’t find any reports about the size of the audience, but I assume it numbered in the thousands. If you did not see the debate yet, you can watch it for free for a limited time at debatelive.org, and I recommend that you do so. Ken Ham believes in the biblical account of creation. He believes that the book of Genesis is a historical book that records the actual history of how God created the heavens and the earth. He believes that God’s work of bringing all creatures into existence took place over the span of six ordinary 24-hour days. Ham is the founder of answersingenesis.org, a website devoted to teaching and defending the record of God’s act of creating the world found in the book of Genesis. Bill Nye is an unbelieving scientist. During the debate Nye did not say he had no religion, but he argued that religion should be divorced from science. He views the world from a purely naturalistic perspective. God had nothing to do with the origin of the world. And God has nothing to do with the development of the world. The universe started with a Big Bang and has developed over billions of years through the process of evolution. Nye stated several times during the debate that evolution is a process by which complexity is added to the universe. By means of evolution, simple non-living things have become more complex living things. Thus, all things in the world (rocks, plants, animals, and humans) have a single origin. Ken Ham accurately described Nye’s position as “molecules to man” evolution. Human beings should look not only at monkeys as their ancestors, but rocks and trees as well. I found the debate between these two men fascinating. Both men demonstrated that they have a vast knowledge of God’s wonderful creation. They discussed layers of ice with atmosphere trapped between them, the distribution of fossils in layers of rock, the expansion of the universe, the 2nd law of thermodynamics, radiometric dating, and many other fascinating subjects. Ham and Nye were very sharp and clear in their presentations, so that even children could follow along (mine did until they had to go to bed). The two men asked each other profound questions. Ham asked Nye how he accounts for non-living things becoming living things if life did not come from God. He asked him how he accounts for the laws of logic and of nature if they were not created by God. Nye asked Ham how he can believe the earth is only 6,000 years old since scientists have discovered rocks and other things in the world that appear to be over 6,000 years old. He asked him how there could have been a flood 4,000 years ago when there are trees scientists estimate to be over 9,000 years old. Wouldn’t those trees have died during the flood? Sometimes both men were unable to answer the questions posed to them. Nye was asked by one of the audience members where the atoms came from that produced the Big Bang. He admitted that he did not know where matter came from. He also admitted that he could not explain where consciousness came from—that is, from his evolutionist perspective he could not explain how consciousness developed from unconscious matter. Ham admitted that he could not answer certain questions about why the earth appeared to be older than 6,000 years old (I wished that he would say something about God building age into the creation, but he never did). He could not explain why there were 680,000 layers of ice in the arctic north, which many scientist claim would have taken 680,000 years to form at the rate of one layer per year. He mentioned that there are plausible theories that explain how those layers could have formed at a much quicker rate than one layer per year, but he readily admitted that they were only theories. Ham also admitted that he could not explain why different types of fossils in the layers of rock in the Grand Canyon were not mixed among each other in all of the layers. Several times during the debate Nye referred to these fossils in the rock layers of the Grand Canyon. He explains the fact that different types of fossils are not mixed among the layers as the result of the layers forming over a long period time. If the Grand Canyon was formed during the Great Flood, he claims the fossils should be mixed among all the layers of rock. Ham admitted once again he could posit only theories for why the fossils are not mixed. It is interesting that both men were unable to answer certain questions. But more important is the reason why they were not able to answer those questions. Nye was not able to answer questions about the origin of matter and of consciousness because he rejects the authority of the Bible. When Nye admitted he could not answer these questions because science does not provide an answer, Ham responded by saying, “there is a book” that answers these questions, it is called the Bible. The questions Ham was unable to answer were different. They were questions that cannot be answered by science and are not answered by the Bible. They were questions that Nye could not answer, even though he claimed he could. Ham convincingly explained why science cannot answer every question by distinguishing between “observable” science and “historical” science. Observable science is science based on what human beings are able to see. In observable science, scientists are able to establish definite facts. Scientists are able to explain how evaporation works because they can observe it. Historical science is science that attempts to explain things that were unobserved by human beings. In historical science scientists are not able to establish definite facts by means of normal scientific investigation. Scientists might suppose that ice layers in the arctic north took 680,000 years to form at the rate of one layer per year. Or scientists might suppose that the Grand Canyon’s layers took millions of years to form. But these suppositions cannot be established as facts because no scientist was present to observe the formation of the ice layers or of the Grand Canyon. This means that when Ham said he could not give definite answers but only posit theories about what happened in the past in these instances, he was being honest. And when Nye claimed he knows for a fact what happened in the past, he was being dishonest. Ham’s honesty extended to admitting his beliefs could not be scientifically proven either. Why does he believe the earth is 6,000 years old? Why does he believe that a flood once covered the whole earth? Why does he believe that Noah survived the flood in an ark? Ham openly professed that he believes these FACTS because they are revealed in the Bible. Nye was honest about his rejection of the authority of the Bible. He repeatedly ridiculed Ham’s insistence that Scripture is the only proper basis for understanding the origin of the universe. He refused to view the Bible as the word of God. He referred to the flood as Ken Ham’s flood, and to the “kinds” mentioned in Genesis 1 as Ken Ham’s kinds, refusing to acknowledge that the flood and kinds spoken of in Genesis are of God. Thus, Ham was right when he explained that the main difference between himself and Nye is what they view as the ultimate authority. He explained that there are only two options—one must either bow to the authority of God (and His Word) or to the authority of man. Ham’s creationistic perspective bows to the authority of God. Nye’s evolutionistic perspective bows to the authority of man. The debate demonstrated that the fundamental difference between a creationist and an evolutionist is spiritual. The difference is: faith vs. unbelief. After the debate some Christians who accept the claims of evolutionary science that the world is billions of years old and that monkeys are the ancestors of humans attacked Ken Ham as “unscientific” and “fundamentalist.” One theologian, Peter Enns, claimed Ham did not come off very well and did not have any response for Nye’s explanation of scientific “facts.” Enns believes in Nye’s molecules to man theory of evolution and believes that it is unscientific and a poor representation of Christianity for Ham to reject it. And though Enns expressed doubts about Nye before the debate on Twitter, afterwards he praised Nye’s scientific acumen. For Enns the difference is that Nye is a good scientist and Ham is a poor scientist. However, during the debate Ham proved himself to be a very knowledgeable scientist. He also played videos from renowned scientists to prove that creationists are as capable of scientific investigation and discovery as evolutionists. And Ham did respond to all of Nye’s “scientific” claims that seemed to support the theory of evolution. Ham explained very clearly that he does not accept the authority of scientists to explain what happened in the past, especially when the explanations of scientists contradict the Bible. The essential difference between the two debaters is that Ham is a believer and Nye is not. Ham did not cast Christians in an unfavorable light as unscientific bumpkins. I was not at all embarrassed by the way Ham represented the Christian faith. As I was watching the debate I cheered as I heard Ham affirm the authority, infallibility, and inspiration of Genesis, and of the whole Bible. I cheered as I heard Ham faithfully explain the natural meaning of the opening chapters of Genesis, that God created the heavens and the earth in six 24-hour days. I blame the many so-called Christians who accept the evolutionary claims of scientists that contradict the Bible for misrepresenting and distorting Christianity. Many and influential are the Christians who are more interested in defending and promoting molecules-to-man evolution than they are in defending the veracity of the Bible. They bring shame to the name of Christian by accepting that death existed before the fall into sin, that Adam (if he existed at all) descended from monkeys, and every other silly man-made belief that is part of the theory of evolution. It seems that evolution is taking over the church. So I am thrilled that a large audience was exposed to a man with the courage and conviction of faith to stand for the plain truth of God’s Word concerning the origin of the world. I also rejoice that Ham explained the significance of Genesis for Christian morality and for the gospel of Jesus Christ. Why don’t we view people as animals? Why don’t we support the killing of old people and fetuses? Why is homosexuality wrong? Why is marriage a lifelong bond? How did sin come into the world? And why do we need the Savior, Jesus Christ? Ham explained, we find these answers in Genesis if we take it as it is, the word of God. He stood before thousands of people, including many members of major media outlets, boldly asserting the truth of the gospel of Jesus Christ! My children asked me a couple of times, “Who won the debate?” That is often a subjective question. But for those who believe that God created the world in six 24- hour days exactly as He says in Genesis 1, who believe in the supreme authority of God’s Word, and who love to hear the beliefs of the Christian faith confessed and defended, there is no doubt Ken Ham was the winner.